With roots tracing back to 1851, Bridge McFarland’s collective expertise in law and client service spans well over a century. 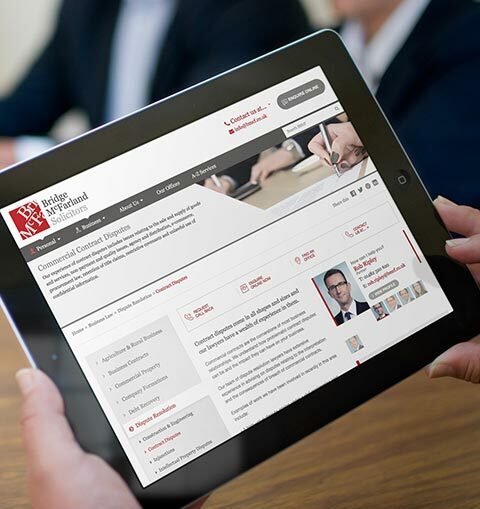 Over the years, the firm’s uncompromising belief in quality client care has lead to multiple office formations and recognition as one of the largest, most successful law firms in the Lincolnshire, Humber and South / East Yorkshire regions. Today, in the age of digital innovation, being within easy reach of your clients means employing all available channels - to deliver information, intelligently. 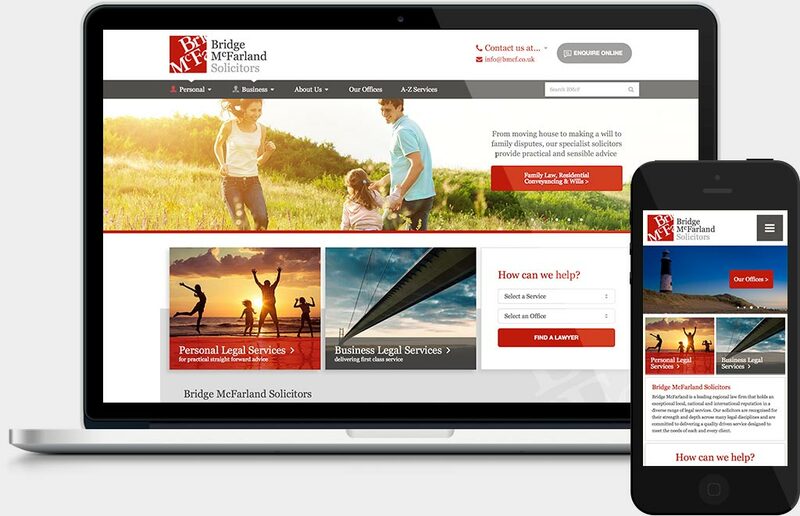 Bridge McFarland recognised the need for a new user-friendly platform to engage clients and reach out to new audiences. The core objective? Online business growth. And so The Energy Cell team were invited to perform a digital makeover. 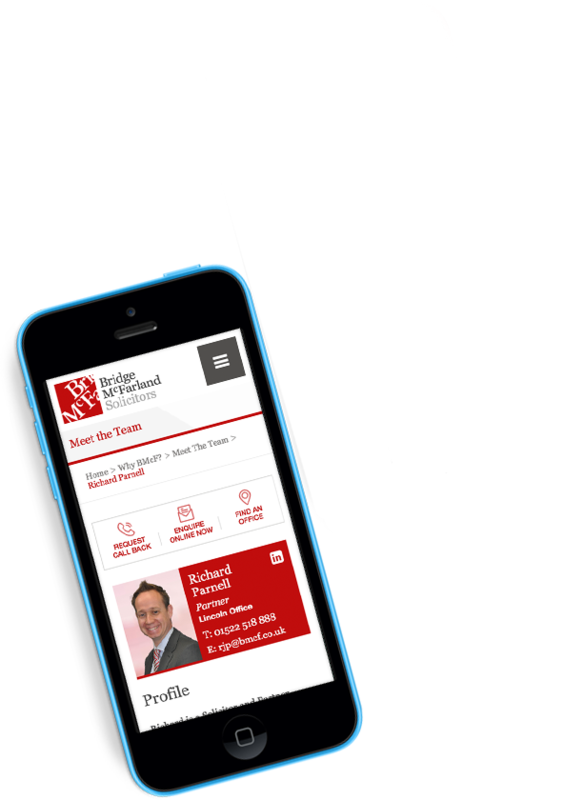 Combining creative and technical expertise, we strategised, devised and visualised a future-proof digital portal that can grow as fast as the business. The evidence speaks for itself. Ever increasing engagement and awareness, a growth in clients and new service-specific mini-sites in development - an open-and-shut success. "The team were a huge help to us..."
The main aim here was simple - or rather, simplicity. 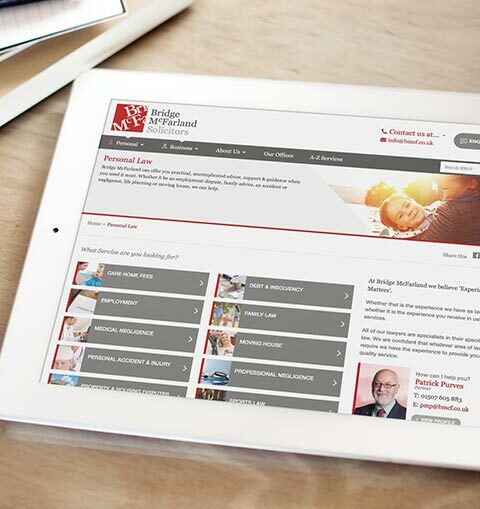 The new website needed to be incredibly easy to use, both for end users to discover services and the Bridge McFarland team responsible for keeping the site up to date. The key to this - dynamically presented content. Every page in the site gives the user access to all the details they could want, and it’s all linked together. 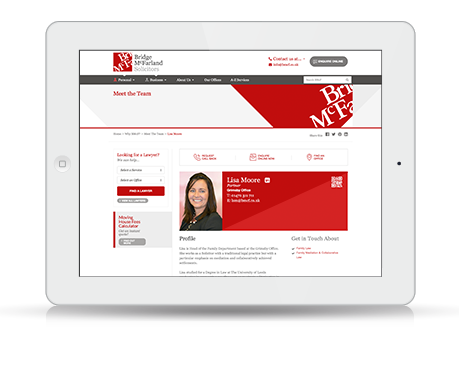 Site managers create team profiles, testimonials, case studies all in one simple form-like format then add to any page, wherever the information is needed. A simple yet flexible system, the firm now has control to manage every aspect of the site. Need to change the navigation? Just drag and drop - job done. With an already strong high-street presence, Bridge McFarland weren’t looking to start from scratch. Our task - inject the online brand with some much needed personality and modern style. The tired old black and red site became a thing of the past with our new base palette; white and warm greys give a softer, friendlier and more approachable appeal. New complementary colours now represent the B2B and B2C divisions of law, so both sections command a distinct yet overall united identity. Each black & white photographic shot, carefully selected to represent it’s respective area, aims to promote a positive, premium image. We all know it’s a competitive market - clichés just won’t cut the mustard. Law is a specialist area, but something we all need a little help with from time to time. 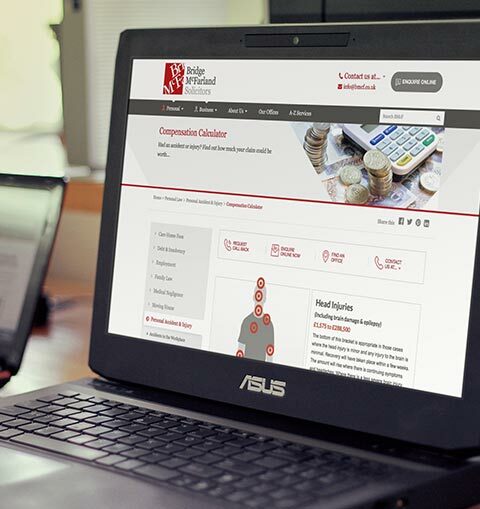 That’s why we came up with some engaging ways to present information, including custom Moving House Fees and Compensation Calculators, plus a brand new Start a Will Online feature. Bridge McFarland aren’t a faceless organisation. 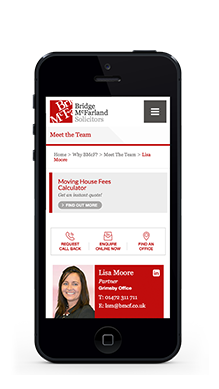 Their team are experienced and friendly - which is why the new site lets you find your lawyer and learn a bit about them, even before you call. 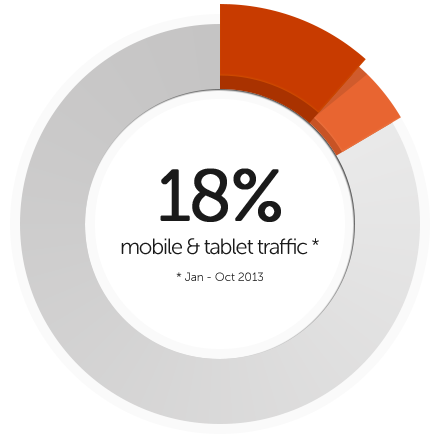 All backed up with strong client testimonials and accreditations. Our focus from the outset - make life easy for the user. We abandoned the legal jargon and engineered in features to make the steps between entry and contact as smooth as possible. A few examples: rollover ‘help’ explanations, QR code contact information and dynamically presented FAQs. 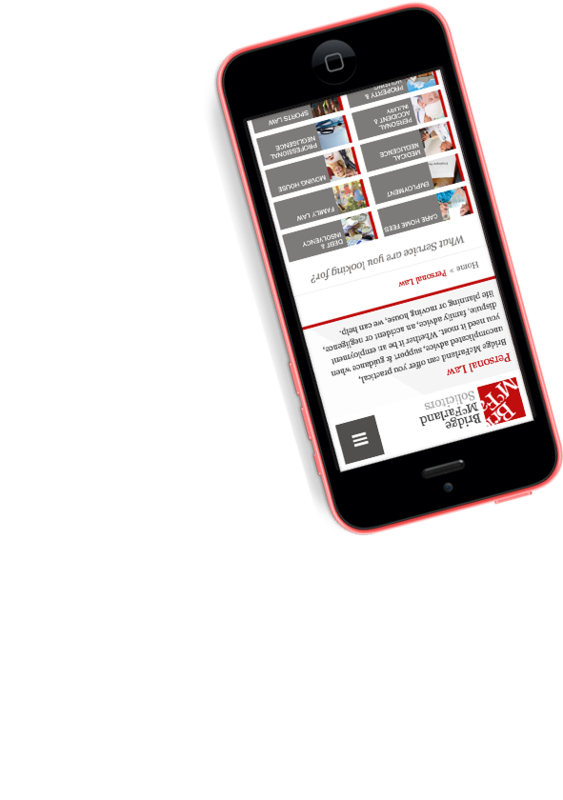 Fully responsive to adapt to mobile and tablet devices., the website maximises the opportunities for people to get in touch - information on the go. Simple isn’t easy. Plenty of groundwork and hard graft from the team, add those little extras, all to make the experience as smooth as possible. No gimmicks, no radical design - simplicity, beautifully engineered.